This is an uncommon and fascinating 1839 Society for the Diffusion of Useful Knowledge or S.D.U.K. map of western Africa. It covers from Mauritania south to the Gulf of Guinea and inland as far as Timbuktu, Mali, including the modern day countries of Mauritania, Senegal, Gambia, Guinea-Bissau, Guinea, Mali, Sierra Leone, Liberia, Cote d'Ivoire, Ghana, Burkina Faso and Togo. 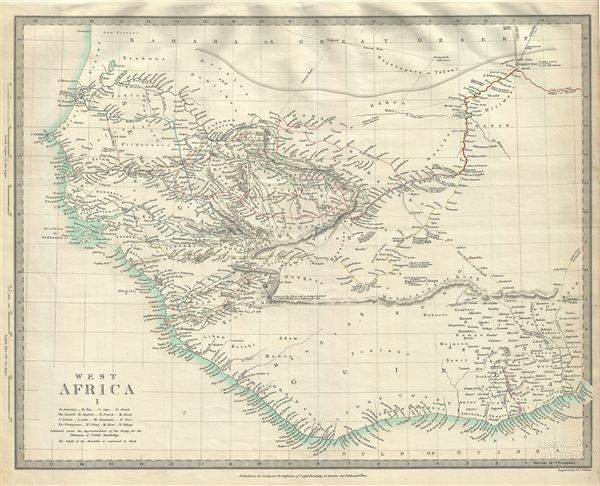 The map names numerous African tribes and nations throughout, and offers other interesting cartographic annotations. Rivers, lakes, explorers' routes, mountains and other topography is also noted, with relief shown by hachure. The map offers interesting inland detail along the Niger River as far east as Timbuktu (Timbuctoo), with the source of the Niger River according to Major Laing' noted near the Mountains of Loma. West of Timbuktu the city of Walet (said to be larger than Timbuctoo) is also identified. The continent is partially bisected by the dramatic and mythical Mountains of Kong, which, based upon the explorations of Mungo Parks (whose exploratory route is noted here), were presumed to be the southern barrier to the Niger River valley. This region was particularly important in the early 19th century as the source of most African slaves imported to the New World. Even so, at the time this map was made, the slave trade, thriving since the 5th century was rapidly diminishing due to decreased demand for slaves in the New World, the British outlawing of slavery in 1808, and subsequent diplomatic efforts including treaties with over 50 African rulers outlawing the practice. Many African economies adapted by shifting to the export of mineral and agricultural resources, which led to the European scramble for territory, occupying most of the continent by the end of the 19th century. Europe's colonial interests in Africa haphazardly carved up the continent into unnatural territories, often forcing historic enemies into close proximity and leading to social problems that remain to this day. This map was originally copyrighted in 1839, but was issued in Volume two of Chapman and Hall's 1844 edition of Maps of the Society for the Diffusion of Useful Knowledge. It was engraved by John Walker of J. and C. Walker. Rumsey 0890.121. Phillips (Atlases) 794.